Final assessments from NADIS confirm that the overall risk of liver fluke is low in the UK, with the exception of south west Scotland which has been classified as “medium”. However, abattoir feedback shows fluke is being regularly detected. The forecast is based on rainfall and temperature data from May to October 2018; but local conditions may still allow fluke and its intermediate host (the mud snail Galba truncatula) to develop to levels that pose a threat to cattle and sheep. Cattle with chronic infections, associated with the presence of mature fluke in the bile ducts of the liver, may show no obvious signs, but fertility and productivity may both be impaired. In addition, a fluke infection can make stock vulnerable to other conditions such as Black disease which can be fatal. As fluke risk is highest on damp, muddy pasture, farmers with out-wintered stock should choose pastures with care. Stock should be monitored for signs of infection. Where animals have been at risk grazing wet pastures, body condition scoring and diagnostic testing of faecal samples can provide an assessment of whether treatment is warranted. “Routine clostridial vaccination can help prevent Black disease and should be considered if not already in place. If in doubt, farmers should consult their vet who can provide guidance of the full range of diagnostic and, if necessary, treatment options,” said Ms Timothy. Where acute fluke infection is found in sheep, treatment with triclabendazole is recommended. This is the only product effective against immature stages of the parasite which cause the most damage and production loss in sheep. 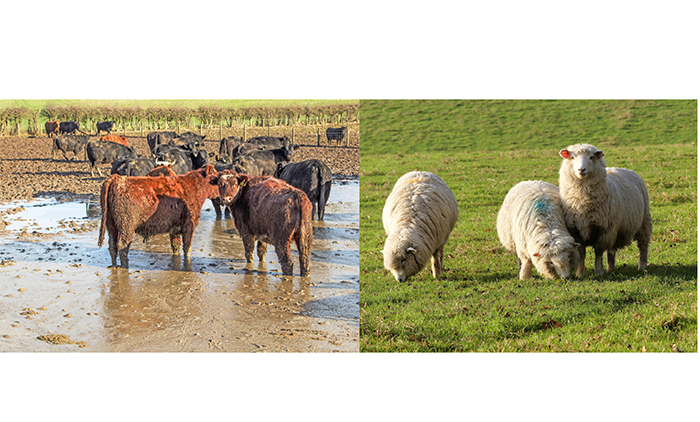 Later in the season, when chronic infection poses the greatest risk, alternatives to triclanbendazole are available to treat both cattle and sheep. The use of products containing active ingredients such as nitroxynil and closantel at or during housing can help remove the impact of fluke on productivity. Retreatment later in the housing period or diagnostic testing to check whether animals have a residual fluke burden, and retreatment if indicated, will ensure livestock are turned out fluke free and do not shed eggs onto the pasture. Given concerns over emerging anthelminitic resistance, testing for treatment efficacy through pre- and post-treatment diagnostics is also advised. The larvae of many disease-causing roundworms, particularly Trichostrongylus species, may continue to be a risk in store and replacement lambs and, sometimes, yearlings into the winter. Sheep grazing potentially contaminated pasture should be monitored. As the weather becomes colder, newly acquired larval infections of roundworm species (includingHaemonchus and Teladorsagia) will begin to encyst and can provide an important source of pasture contamination next spring. An appropriate treatment administered at the end of the grazing season, or once animals are housed, can remove arrested larval stages and reduce the potential for pasture contamination and re-infection at lambing. Suitable products are available across all major worming groups and advice from a vet or an SQP on product choice is recommended. Scab and lice also pose threats to sheep overwinter. While symptoms are similar, treatments are different as scab mites live under the skin and lice thrive in the fleece. Infestations of psoroptic mites (Psoroptes ovis) cause sheep scab and lead to loss of condition, secondary skin infections and potentially death if not treated. Signs include severe itching, wool loss, restlessness, biting and scratching of affected areas and weight loss or reduced weight gain. Fleece may be wet, sticky and yellow, while the skin may become thickened and corrugated. Diagnosis can be confirmed by microscopic analysis of skin scrapings, or through an ELISA test. “Studies show scab mites can remain infective for up to 17 days, so fields, sheds and pens where infected sheep have been kept should be considered a potential infection source for this period,” said Ms Timothy. Louse infestations are typically caused by the chewing lice Bovicola ovis. Lean or emaciated sheep tend to be most greatly affected. Lice can sometimes be detected with the naked eye and confirmed by examination with a microscope. Louse infestations can be controlled with topical products containing synthetic pyrethroids which are most effective on shorn sheep.Both scab and louse infestations can be controlled by plunge dipping with diazinon.